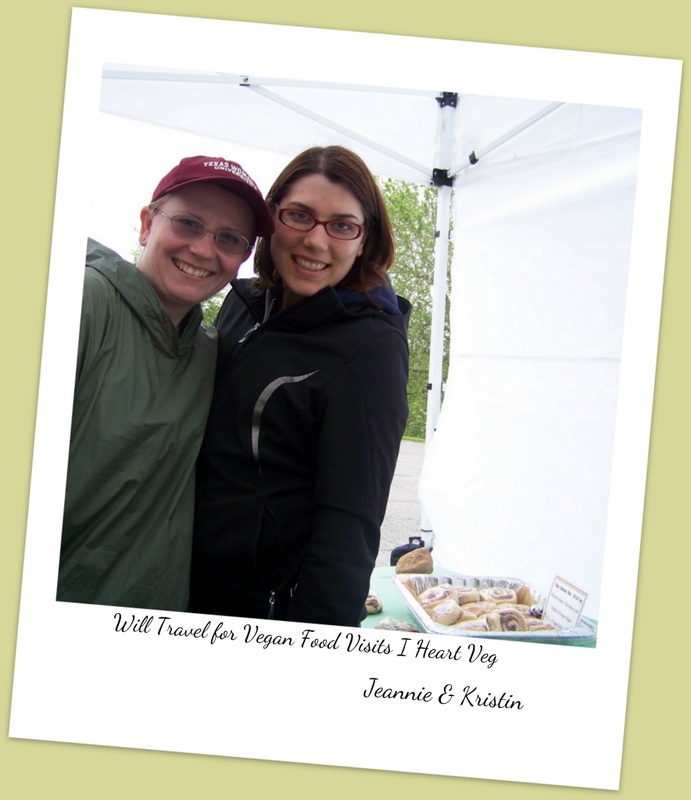 In May 2012 in Weaverville, North Carolina, I met Kristin Lajeunesse, the vegan who “Will Travel for Vegan Food” and through whom I live vicariously as she drives around the United States seeking out and exalting the amazing vegan fare being produced by compassionate hearts and hands throughout the country. A great journey driven by passion and benevolence motivates and inspires everyone met along the way. Kristin wanted to meet me and chat about my new vegan bakery. Unfortunately, the weather had turned cold, windy, and rainy, but good conversation warms the heart. When I get the chance to talk about veganism, my love of Asheville, and my own business dream, I warm up pretty quickly. Thank you, Michelle Wolf, for telling Kristin about I Heart Veg! Kristin drives her trusty van “Gerty” around the United States to uncover vegan eats and share her hungry vegan adventures with the world. She has a goal of eating at every 100% vegan restaurant in the country. She’s relied on generous spirits along the way who have offered her a spot on their couch or welcomed her trusty steed into their driveway. As Kristen explained her idea behind the journey and the obstacles she has tackled along the way, I quickly became an admirer of hers. Instead of making excuses for the stumbling blocks she’d encountered on the trip, she stayed true to herself and released that which held her back and forged ahead on her journey. This lesson can take a lifetime to learn. Her journey is a difficult one, and she is driven with passion. Driving solo for miles across this nation is an exhausting endeavor— both mentally and physically. The great vegan food and people who make it keep her fueled and rejuvenated for the miles that lie ahead. She is supporting vegan entrepreneurs. It isn’t always easy being a veggie. While our numbers continue to grow, we need all the advocates and ambassadors we can get. She is chasing a dream. I have the utmost respect and admiration for anyone who tries to accomplish a goal. I love courageous people. I know how easy it is to be distracted by negative thoughts and take the easy road and choose to shut out your vision. Kristen is open to where the road ahead might lead, the detours that may require a reroute, and the impact others can have on our own lives. She is truly blossoming on her trip, and the impact it has had on her shows in every update and blog post. Additionally, I love that her parents are vegans, and that her brother got the ethical food choice ball rolling in the family. I feel so blessed to have been a part of her journey. 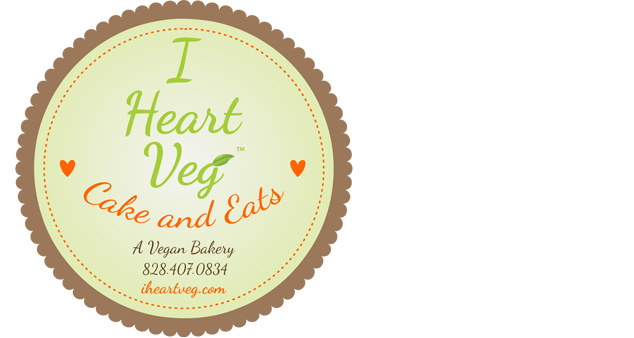 Kristen wrote about I Heart Veg in the blog post detailing her trip to Asheville, North Carolina. The post went up when Loren and I were faced with the decision to close the bakery in Asheville and move to Charlotte. Needless to say, when we read the post, we dissolved in tears, and I couldn’t write about it at the time. Her kind words were just so beautiful, and came at such a time of grief, that I, frankly, couldn’t speak. After 13 months on the road, Kristin has recapped her year, and listed me as one of the 14 most memorable people she has met on her journey. I bawled. Heavy, ugly bawling. Kirsten, thank you. I’m so touched and empowered. It has been a difficult year. We had a major move (twice), incalculable struggles and obstacles, a family death, and an uncharted map. We, like Kristin, are still on a journey. I don’t know what the future has in store for us, but I know we will continue on; we must. Passion should NEVER be ignored, and once it has taken hold, it will not be silenced without a fight. Three times in my life I refused to take a leap. I was offered opportunities that would have expanded my world and taken me on a very different path. I’m not saying any path may have worked out, but I was scared of the unknown, and that fear was life altering. I cannot know who I would have become had I taken those chances, but I know my lack of action affects me to this day. Life is short. I want to jump, leap, and do all I can while I can. I want to live. Not exist, not get by, but live. Once you recognize how precious every moment is, you can’t help but be forced to live in every moment. Kristen, drive on, my sister! Thank you for coming out to meet me, and the generous spirit in which you’ve shared my work and dream with others. I am, forever, a member of your sisterhood of the traveling vegan expanding pants. You are on a great journey, thank you for taking us along. You will always have a spot at our vegan table. Follow her travels, and send loving thoughts her way! Make a donation to help continue her journey.